Here are ten tips to make a good Impression and influence the panel in an Interview. I have observed these personally over 10 years of sitting on panel interviews. The best way to find common ground is to find out more about the position or the panel at the beginning of the interview, before launching into the question and answer part of the interview. Establishing some common ground is the best way to effectively “sell” yourself to the panel. For example, a car salesman might ask a customer what the primary purpose of their next car will be. If the customer says that they have a small family and they are upgrading to a larger car, the salesperson might make a connection by talking about his young family and offering tips on what the customer should be looking for based on his experience. In the job interview, if you can find out what the key “needs” are in the position and align these specifically to what you have done in the past and what you can offer, showing the panel “what’s in it for them.” By doing this you will be creating common ground with the interview panel and appealing to what they want in a new employee. 2. Say your words clearly. If you find that you get nervous and tongue tied during interviews, practice what you want to say before the interview and intentionally slow down your speech during the interview. Listening to someone who is speaking slowly and deliberately is always better than listening to a fast talker. Bring up some achievements early in the interview. Being honest also establishes credibility, so if you directly asked if you know something and you don’t, confess! 4. Listen to what the other person is saying. The interview should be a conversation where you respond to what the interviewer has said before you. The interview is not designed to trip you up, you will be told exactly what to say! Listen to the interviewer carefully and take on board not only the question they ask but also what they have said previously in order to frame your answer most appropriately. A lot of applicants have the tendency to start thinking about their response before the interviewer has stopped talking. This is usually due to nerves but can become costly if you don’t fully listen to and understand what the interviewer is saying. Be intentional about not thinking about what to say until the interviewer has finished talking. There is nothing wrong with a few moments silence before answering their question. If you are asked a question and you don’t know what it means, ask. If you are asked a question and you’re not sure how it relates to the job, ask. If you have answered an interview question and are not sure if you have covered all angles to the panel’s satisfaction, ask. If you make a point, clarify what you mean by that point. Clarifying points and issues will show a genuine interest and it demonstrates higher levels of intelligence. 6. Be sensitive to nonverbal cues. If a panel member is looking out the window, maybe you are rambling on or are not speaking to the topic. If a panel member is squinting their eyes or scratching their head, maybe they don’t understand and you need to clarify more. If the panel members are leaning forward and making eye contact, you have their full attention! Take these cues as prompters as to the direction of your discussion. You have to back up your claims with evidence. Your interview is a proposal and you are the product. You need to provide evidence regarding why your product should be the one selected! If you can’t offer a clear benefit then you need to modify your proposal so that there is one. Solid evidence will stick in the minds of a selection panel more than someone’s theory or general discussion of a topic. What people respond to is “vivid” evidence that brings your concept or argument to life. Use metaphors and analogies to make your concepts and ideas tangible. 8. Create an emotional connection. An emotional connection in an interview can be made in two ways, and all the better if you can do both. Firstly, as a candidate, you will be more memorable and likely to rate higher if you have a high likability factor. Emotions are primary factors in motivation and decision making. People want to work with those they like, they want to help those they like and their perceptions are more likely to be skewed in your favour if they like you. Likability can be increased by showing confidence, remaining relaxed and smiling a lot. The second emotional connection is with the industry or position. This may mean showing enthusiasm and passion for the industry or the position and communicating how and why you are passionate about the position to the panel. After all, the panel want to know that they are choosing someone for the position who is going to like the job and be highly motivated to put in the effort and do well. 9. Don’t make a strong sales pitch. This will just turn the panel off and all your hard work will be wasted. Just like you will back off if a salesperson gets too pushy in a store, the panel will get their backs up if you come on too strong. 10. Agree with the interviewer and speak to their ego. No one likes anything more than someone agreeing with them and making them feel more powerful, especially interview panels! Although we didn't write this guide, we are big fans! It has been tried and tested by our government recruitment consultants and also our customers with amazing results. ** This publication is currently discounted, at almost 50% off. This ebook has fantastic advice and answers to common and tricky interview questions, for interviews both in the public and private sector. We highly recommend it! Read more about this ebook here. 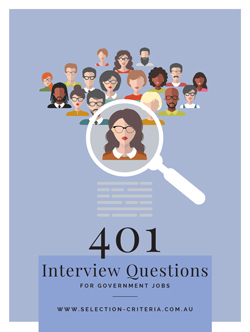 401 questions commonly used in government interviews. 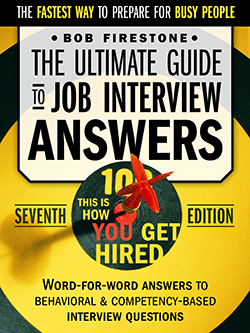 Download the interview questions book here!